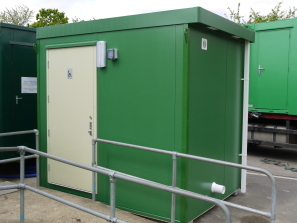 Located in Ilford and commissioned by the Local Authority, this purpose built single Modular Disabled Toilet Building now provides a stand-alone, fully DDA compliant toilet for the disabled working on a local allotment site. This Prefabricated Building provides a total floor area of 5.25 sq. m and incorporates a full Doc M pack c/w blue rails, a 10 litre infra-red disabled hand-wash water heater and lever taps. Internally, the walls and ceiling are finished with an easy to maintain vinyl faced plasterboard whilst the floor is covered with 2mm "Polysafe" vinyl. Heating is by way of a high level, wall mounted 2kW fan heater. Externally, the walls and fascia of this Modular Toilet Building are finished in low maintenance plastisol steel (clients choice of colour). The roof is constructed with a mono-pitched flat roofing system and covered with a hard wearing 'Hypalon' blanket with square section uPVC guttering and downpipe. This Modular Unit is an ideal solution for providing toilets for the disabled in unusual locations and at very competitive prices!